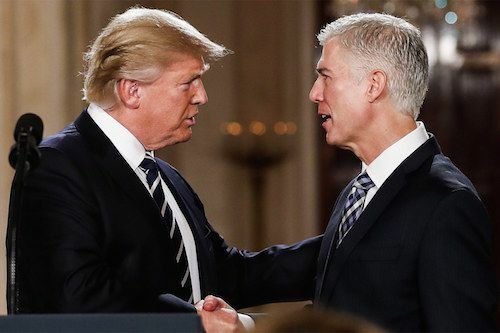 Neil Gorsuch, Donald Trump's pick for the Supreme Court, has shone during his Senate confirmation hearing this week and proven he's more than worthy of filling the vacant seat. His credentials aren't the problem though; the dilemma for Democrats is whether they reward or attempt to punish Republicans' decision to stonewall former President Barack Obama's choice, Merrick Garland. Either choice will have significant implications for the court's future composition. If Democrats block Gorsuch's confirmation, it could send a message to Republicans that they crossed a line by ignoring Obama's nominee. However, the move would rile Trump, his supporters and Republicans in Congress, limiting any prospect of cooperation in the coming months. And Republicans have threatened to use the 'nuclear option' - reducing the vote threshold required for Gorsuch to be approved - if Democrats attempt to filibuster his confirmation. Approving Gorsuch might indicate to the public that Democrats can look beyond partisan infighting and appreciate an excellent candidate. The Colorado-born Tenth Circuit judge has convincingly dismissed concerns that he's a Trump stooge; all signs suggest he's a thoughtful, devoted scholar who rules without fear or favour, respects the Constitution and the Supreme Court's role in protecting civil rights, and won't show bias towards corporations or against women or minorities. He claimed that if Trump had asked him to scrap Roe v. Wade during his interview, he would have walked out of the room. If Democrats help to confirm Gorsuch, some will view it as a capitulation, an endorsement of dirty tricks and an undeserved victory for the GOP with immense repercussions for civil rights and the laws of the land. However, it would set a firm precedent that if a Supreme Court justice dies in the final year of a presidential term, the next president will choose the judge's successor. If Republicans act in good faith - arguably a big if - they will abide by that rule if a justice dies in 2020, and if Trump or another Republican is elected, 2024. Republicans have excused their behaviour by citing the 'Biden Rule'. Former Vice-President Joe Biden - while serving as chairman of the Senate Judiciary Committee in 1992 - argued that if a Supreme Court justice stepped down, then-President George H.W. Bush shouldn't nominate a replacement until after the election. He pointed to political tensions and public distrust in the confirmation process. Biden also argued that if the president did pick someone, the Senate might want to hold off on confirmation hearings "until after the political campaign season is over". However, the Senate never took a vote to adopt the rule, which was proposed three months later in the election cycle than when Supreme Court justice Antonin Scalia died last February. The situation was also hypothetical; there was no vacant seat or nominee to consider. And Biden's words indicate that post-election hearings - which Garland didn't receive - would have been appropriate. Gorsuch is affable, experienced and comes across as a careful, considerate and discerning judge. Garland might have been just as impressive, but Democrats won't gain from remaining aggrieved. They should support Gorsuch's nomination - which looks set to go through regardless - and parlay their brownie points into passing bills, securing concessions and potentially delaying the next Supreme Court nomination in their favour.